This card is entered into the Crazy Crafters Team Highlights this week. Click here to see all the entries and vote for your favourites. The True Gentleman Designer Series Paper is gorgeous ... in a very masculine way! Can you guess for whom I made this card? !!!! 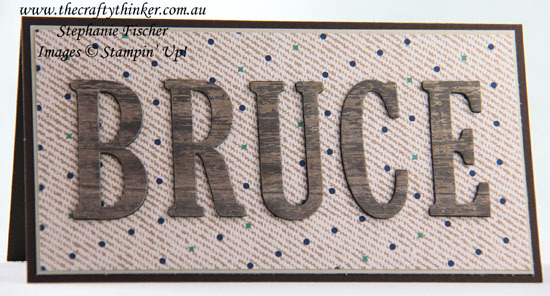 Hopefully the letters of the name look hewn in timber as Bruce is a great handyman! 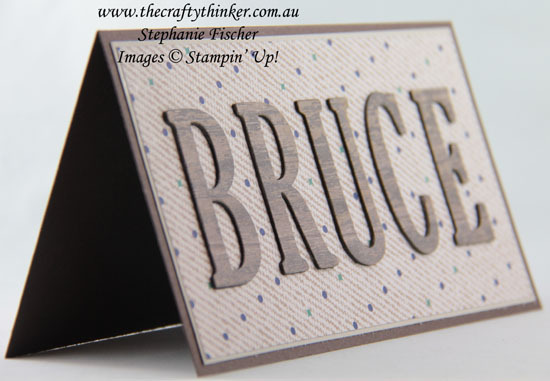 This project started out as an eclipse card - I cut the letters out of the background paper - however, I then had a change of heart and decided to use the woodgrain paper for the letters as Bruce is an ace handyman! The Early Espresso base card is 7.5" x 4" with a layer of Sahara Sand followed by the layer of True Gentleman Designer Series Paper. This is a sneak peek from the Occasions Catalogue which launches in just a few days on 3rd January!